Greetings from Northernwrites , your guest editor for today's Poetry newsletter. Meter, rhyme, and form are not the only tools available for creating structure in poetry. Everyday things that you have been learning since you were a toddler and ideas cross-pollinated among the arts and sciences can enrich the creative experience and expand the possibilities for discovery. The best thing about them is that it doesn't matter whether you're writing free verse or traditional poetry. 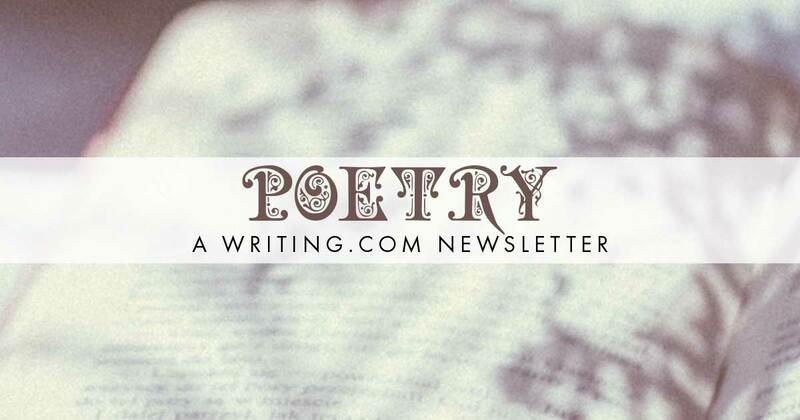 Today's newsletter will discuss a cross-pollination between universality and poetry. In "Poet As Lens, Poet As Filter" , I talked about two ways that a poem is affected by the poet's attitude about what he writes about, and how they are illustrated by the poem The Snow Man by Wallace Stevens. Still -- this poem has already lasted for nearly a century. It was published in 1921. If the reader's experience is weaker, and the details and imagery are weaker, something else about this poem must make it worth reading. What is that? It took a couple of years, but someone finally asked about it. Today I'll answer the question. Are readers attracted to fresh and captivating wording? Probably not. Of the 108 words in the poem, only six, with one being a variant of another, are less common in the context of "what most people who have been in winter would expect." These few words contribute some freshness to the poem and the imagery. The sparseness of the interesting words scattered among the majority of common words does echo and support the content. The poet uses some word play in the last stanza. The overall structure of the poem is like a joke. The beginning sets up the unexpected pay-off or punchline at the end. The end of the poem gets emphasized by the surprise. The word play is used to express an abstract idea. Abstract ideas tend to be weak. They're hard to experience with the senses. In this poem, the content and wording are used to give concreteness to the abstract idea -- to give the reader a way to experience the idea through the senses. The poem acts as a frame or a setting for the idea. This is the reason the imagery and wording aren't that strong. As it's supposed to, the frame or setting supports the content without upstaging the main act. A metaphor compares one thing A to another thing B as being the same in some way. Poems can put the A part of a metaphor on the page, and just imply the B part of the metaphor. One could think of such a poem as being like a fully finished first floor on a house, with the metaphor being the second floor that's still under construction. The first floor provides the access to the second floor. It would never work to start construction with the second floor. If the first floor isn't built first, the second floor is inaccessible. In poetry, concrete imagery comes from what can be seen, heard, touched, smelled, or tasted. These shared sensory experiences are what writers and readers have in common that can be used to create a bridge to something that isn't already shared. The shared sensory experiences provide the access. Like the house, a poem that isn't grounded in concrete imagery doesn't provide reader access to its metaphors. The concrete imagery has to be on the page first. Such poems work across a broader audience when they provide enough content of interest that a reader who doesn't see the possibility of the metaphor still has something on the page that they can enjoy. This poem is constructed so that it can be read as a metaphor for something that is of universal interest. If the reader asks himself, "What else could this be talking about? ", the poem gives clues and hints rather than coming out and explaining what the metaphor should be applied to. Part of the clues are the structure, grammar, and poetic tools which support the content. The word play, the surprise, and the concrete half of the metaphor help make the abstract idea sticky. Stickiness is when an idea tends to hang around for a while in the reader's mind, instead of coming in one ear and going out the other. Another factor also helps make the content sticky. A universal theme is an idea that applies to anyone regardless of cultural differences, or geographic location. Universal themes are ways to connect ideas across all disciplines. It is a central idea about the human condition. It is a generalization about life or human nature; they deal with basic human concerns. For writers, universality is a term used to talk about the audience for a piece of writing. Universality means that anyone who reads it can understand and relate to the content of the piece of writing, no matter what their background is. In other words, writing that is universal has a large audience for a long time. The paradox of universality is that although a universal theme is a generalization about life or human nature, writing cannot convey such a theme by being general. So how does a writer convey a universal theme? Because the abstract idea is wrapped in something that is concrete and specific, the metaphor can connect the reader to something universal. Universality is rooted in a specific example. The poem is a self portrait of the inner life of the poet, and it uses the word play to share an observation about the way this specific poet thinks things are, feels things are, and sees things are. That glimpse into the inner life of another particular person is what gives the poem its universality and makes it worth reading. We read such works to gain a better perspective on ourselves, whether we find parallels or contrasts in the work on the page. If you're interested in a detailed analysis of how it's written, see Day 26 from Aurora Borealis Collection . For my son Lynx on finally getting his hair cut. 2nd Place Shadows & Light contest. A rose pressed in a book is used to help remember True beauty and love that could not be. Your challenge: Share one professionally written poem (or excerpt) per day for 30 days, and tell us why you like it. What part is the best? Why is it special to you? What are your thoughts on the poet? Anything from Spenser and Shakespeare to poets published in the past year is fine with me. Comment: Love how clearly you show the different types of teachers/teaching styles there are out there — what an informational newsletter! Until our paths cross again, keep writing! Generated in 0.54 seconds at 6:09am on Apr 25, 2019 via server WWW2.